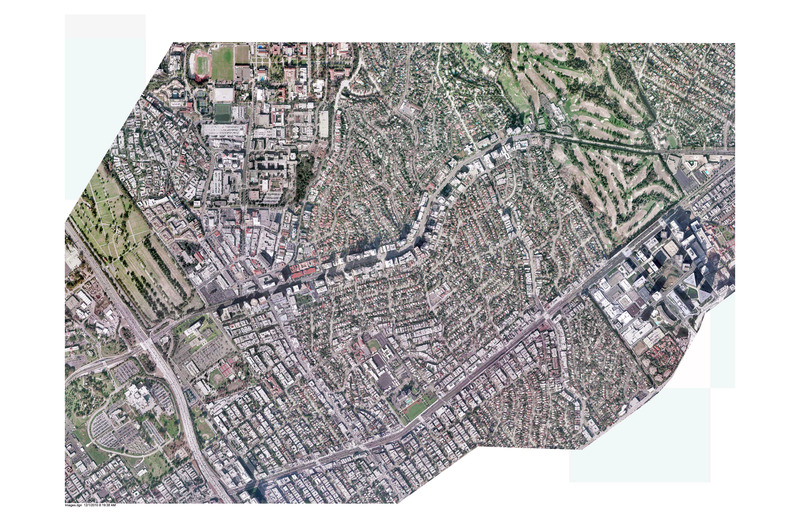 A look at Westwood from the 2007 Alternatives Analysis study done for the Westside Subway Extension project. Click above to see a larger image. Heavy winds subsided and the skies were crystal clear Tuesday, making it the perfect day for the Westside Subway Extension to take to the air to do aerial surveys of the planned route. This is all part of the ongoing environmental and engineering analysis for the project. 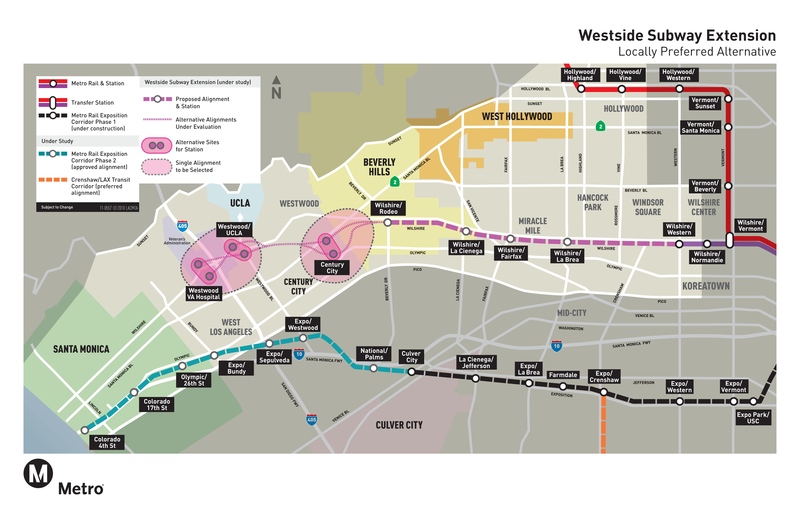 A map of the route selected for the Westside Subway Extension; in Century City and Westwood the exact route has yet to be finalized. Click above for a larger view. More than 100 aerial photographs were taken from the plane, with each image capturing about 1/12 of a square mile. The photos cover the entire route that is now going through final environmental review plus Metro’s subway rail yard in downtown Los Angeles. Aerial photographs were taken in 2007 at the beginning of the Alternatives Analysis for the subway project. At that time, a much wider area was under review, as the agency was considering what kind of project — if any — would best serve the Westside. Now that the Metro Board of Directors has selected a project and a route, these photographs will focus, pun intended, in much greater detail on the alignment being studied. The information gathered from the photographs will be used for the civil engineering work being done for the project. The photos will identify the latest developments that have occurred along the route as well as the latest information for the street system in the area. Clear “control panels” along the ground are being established for the photographer to capture. Among other things, information from the aerial survey will be used as a basis for any minor adjustments to the alignment that may be needed. Photos will also be able to more accurately locate buildings above or near the tunnels and stations. These pics are old, they weren’t taken Tuesday. All the trees are still standing at the Wilshire on/off ramps. If you’ve driven by there recently, you know they were cleared out a while ago. Is that image from 2007? Yes, the photo is from the alternatives analysis in 2007. Steve– are these photos superior to what’s freely available via Google Earth? The big advantage of these photos is they’re up to date as of yesterday. Google Earth images are taken from satellite images that can be months or years old. Just to be clear – the photo linked above must be from the earlier (2007) arial survey or some other source. The reason I say this is that the I-405/Wilshire interchange and VA Campus shown on the left side of the image lacks any indication of the I-405 Sepulveda Pass Construction Project activities that are currently under way in that area. That area is currently cleared of the previous CalTrans landscaping and has various structures and underground utility work on going. Yes, yes, we all read the caption. The photo’s from 2007. That’s not the point of this story.